Over the last few months, Dan Rascal has been busy offering video production workshops to young adults across the city. Partner organizations have run the gamete, including The House of Paint Arts Festival, Awesome Arts , MASC and the The City of Ottawa. At its core, it’s about Graffiti Writin’, Bboy/Bgirlin, DJin’ and MCin’. The House of PainT event brings the four elements of hip hop together – with writers covering concrete walls while DJs and MCs fill the air with beats & rhymes and bboys, bgirls an’ their crews throw down. Concession stands sellin’ art, clothes and crafts by local artists, a community BBQ serving summer foods, a kids corner and workshops teachin’ mural painting, breakin’, DJin’ and the history of hip hop and urban life in Canada and the world. Dan was in the “house” offering a DIY MUSIC VIDEO PRODUCTION WORKSHOP. We discussed tech innovation, micro crewing, harnessing the local, the power of gratefulness, dogma 95 and some basic audio-visual production methods that can yield big results on small budget. For ten weeks Dan Rascal worked with the Lowertown Youth and a number of slam poets to produce a series of cinepoems that addressed local issues within their respective communities. Dreams of a Dream and Gang Violence, two new cinepoems by poet brothers, Bryce Wilson & Alex Powers were the result. It was our job to teach and facilitate the creation of their personal works, films that spoke to issues of abuse and violence. MASC brings the arts and culture alive for over 100,000 children, youth, teachers and seniors each year.With a passionate commitment to provide schools and communities with experiences of artistic excellence and creative process, MASC proudly represents a roster of over 60 professional artists. All MASC artists have undergone Vulnerable Sector Screening. 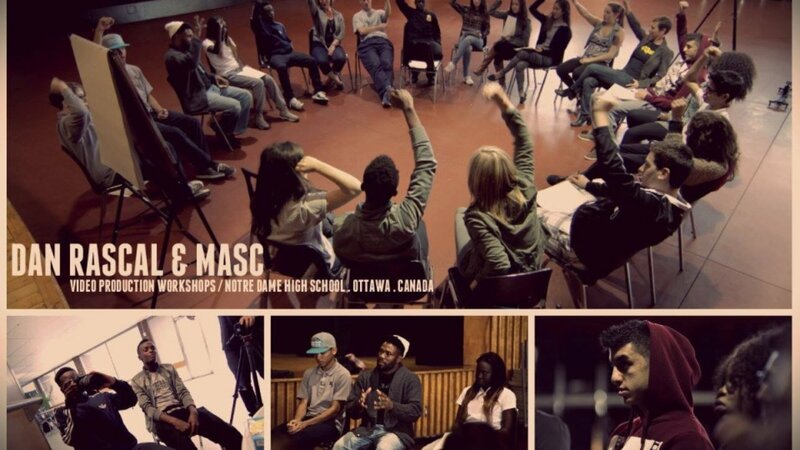 Working out of diverse cultural traditions, MASC artists offer workshops, performances, artist-in-residence programs and professional development in music, dance, drama, literary, media and visual arts. For this particular workshop, Dan Rascal teamed up with slam poet Just Jamaal and Notre Dame High School to address the issue of dating violence. Our objective was to create a series of cinepoems for both male and female perspectives on the issues.